“If he comes in, take him,” I whispered to my companion as I got ready to cut loose with some high-pitched squeals and squalls from my diaphragm turkey call. The coyote trotted out of the creek bottom 100 yards across the harvested soybean field, evidently in response to my hen yelping. The instant I filled the air with prey-distress sounds, it headed our way on a dead run. It looked as if the coyote was centered on our position and ignoring the two jakes and hen turkey decoys 20 yards out and off to our left. Not so! My partner was just about to squeeze the trigger when the coyote made a sharp turn, grabbed the nearest decoy by the head, which immediately came off in his mouth. Hard to tell who was the most shocked — my compadre or the coyote. After a few bouncing hops the coyote spit out the plastic decoy head, kicked in the afterburners and headed for the creek bottom. I was laughing so hard I darn near swallowed my diaphragm call and my companion was still trying to figure out just what the hell happened and forgot all about shooting. Decoys should be a part of every predator hunter’s bag of tricks and can only help your calling stands. 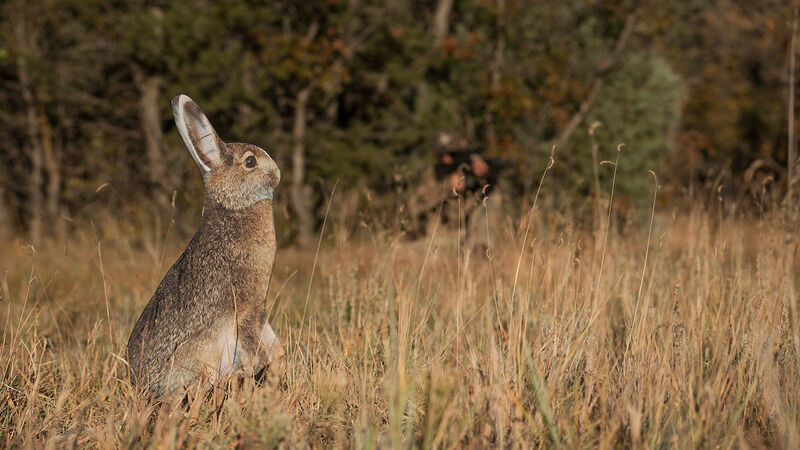 Many predator callers simply don’t want to tote an extra piece of equipment with them on their predator-hunting jaunts, especially equipment that requires batteries and a remote control to operate. However, in my estimation, a decoy is a necessary tool to help beginning and experienced predator hunters achieve success. And when they work, they add a whole new dimension to the calling action. The biggest advantage of a decoy — especially a moving or motion decoy — is that it appeals to the predator’s visual acuity, which helps draw the predator’s attention away from the exact location of the caller. While this can be accomplished with the judicious placement of an electronic caller, a motion decoy can increase the effectiveness of the overall ambush and add to the effectiveness of a remote-controlled electronic caller. A motion decoy can be even more effective for hunters using a mouth-blown call. Over the years, I’ve used a whole passel of different decoys,: some successful and some not so successful. My first decoy — long before electronic callers became popular — was a metronome, which is a musical device designed with an arm that moves back and forth ticking so the instrument player can keep time with the music. I tied some feathers to the arm where they would flip back and forth. Archaic, sure, but I managed to fool some red fox with this outfit. One of my brilliant ideas (at least I thought so) that turned into the worst decoy ever was a full-body mount of a large tom bobcat with a jackrabbit hanging in its jaws. I figured this would be deadly for coyotes and cats alike. Wrong! The size of the bobcat intimidated everything that got a good look at it and, after one season’s use and missing a number of rapidly retreating predators, I donated it to a friend’s trophy room. Years later, I bought a small, realistic-looking, rabbit-fur toy housecat with a little fur kitten hanging from its mouth at a garage sale. I’ve used this cute little con cat successfully on a number of occasions in conjunction with electronic motion decoys. I’ve shot several coyotes and bobcats within a few yards of the little cat decoy. Size does make a difference! One of my favorite and most deadly decoys was a winter-pelted, whitetail jackrabbit mounted by Frank English of Rapid City, South Dakota. The rabbit is mounted on a base in such a way that pulling on a cord makes it sit up. Releasing tension will drop it back down. The realistic decoy is highly visible without movement and made even more deadly by moving it up and down. Unfortunately, after a few years of deadly-effective use, the mice in my gun room completely de-furred the jack for nest material. Today, manufacturers like FOXPRO, Mojo, Hunter’s Specialties and Convergent Hunting’s Bullet HP electronic predator caller all have motion decoys available that are remote controlled and work extremely well with or without electronic callers. In addition to motion decoys, I’ve also used coyote decoys on occasion with excellent results. They work great for distress sounds and coyote vocalizations. The main drawback to these decoys can occur when used in areas where you’re liable to call up a bobcat or fox. These less aggressive predators aren’t about to approach the caller with a coyote decoy present. Without doubt, the ultimate coyote-calling decoy is a trained, coyote-tolling dog. But generally that’s not in the realm of reality for most predator hunters. Regardless of the decoy you use to con predators, never leave home without it!